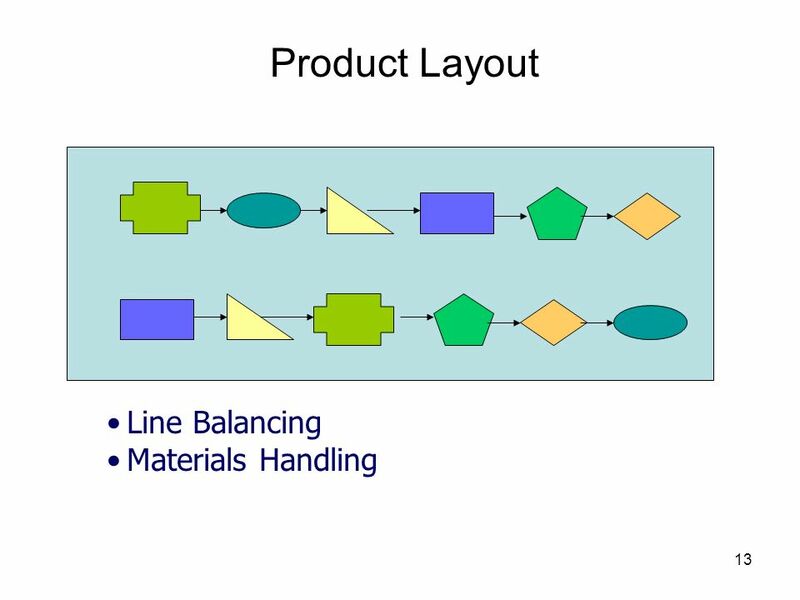 Main Features: Planning tool geared specifically to assembly operations. 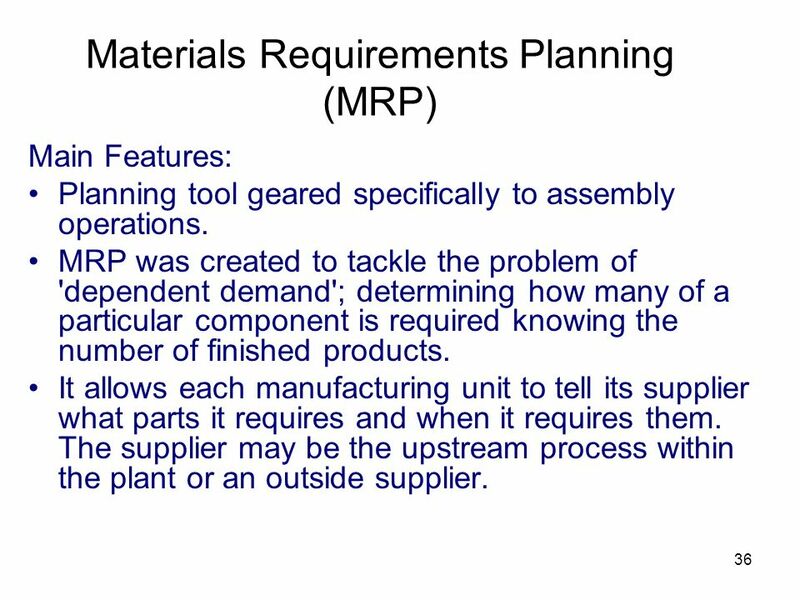 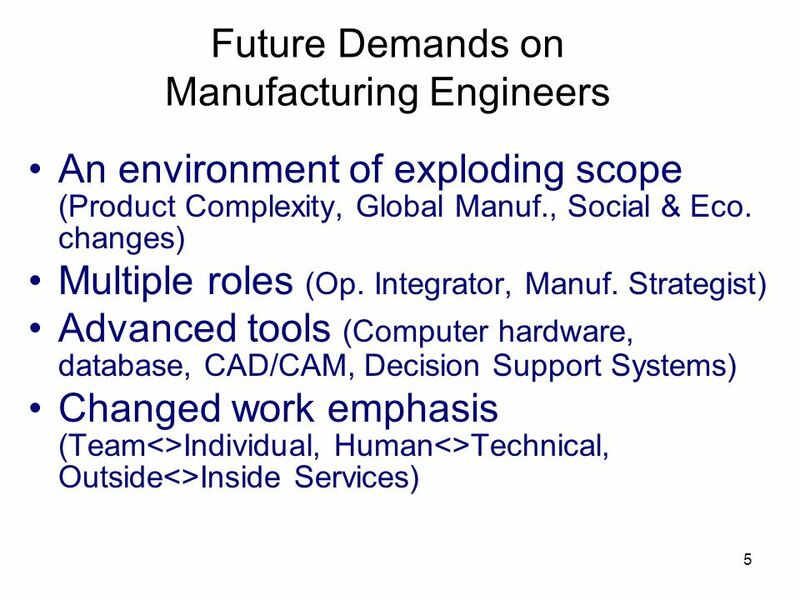 MRP was created to tackle the problem of 'dependent demand'; determining how many of a particular component is required knowing the number of finished products. 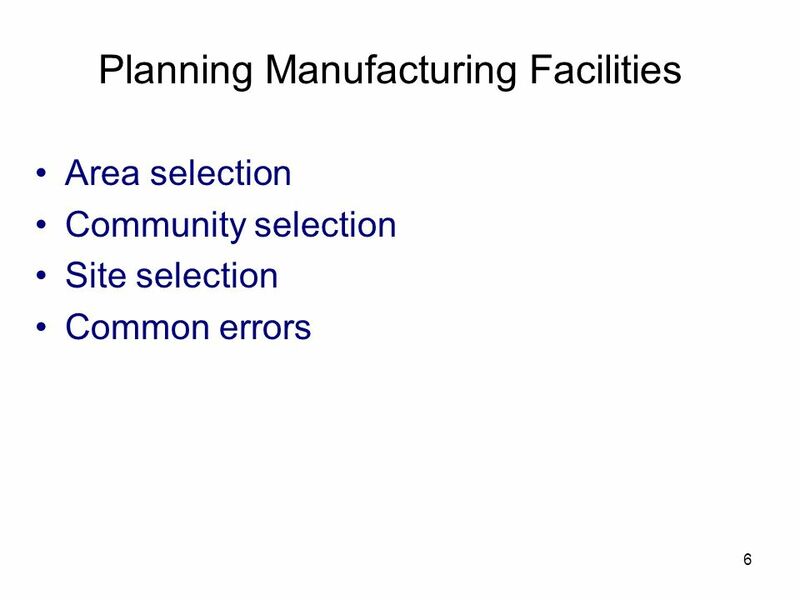 It allows each manufacturing unit to tell its supplier what parts it requires and when it requires them. 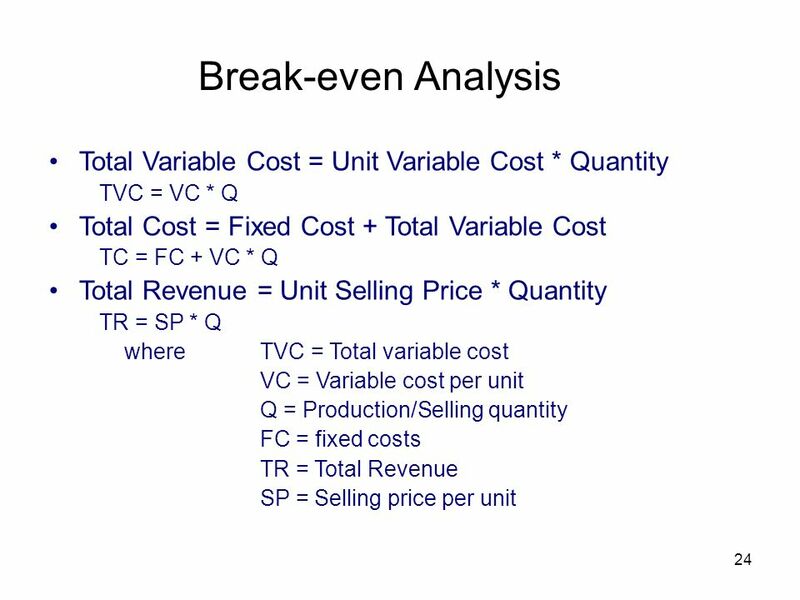 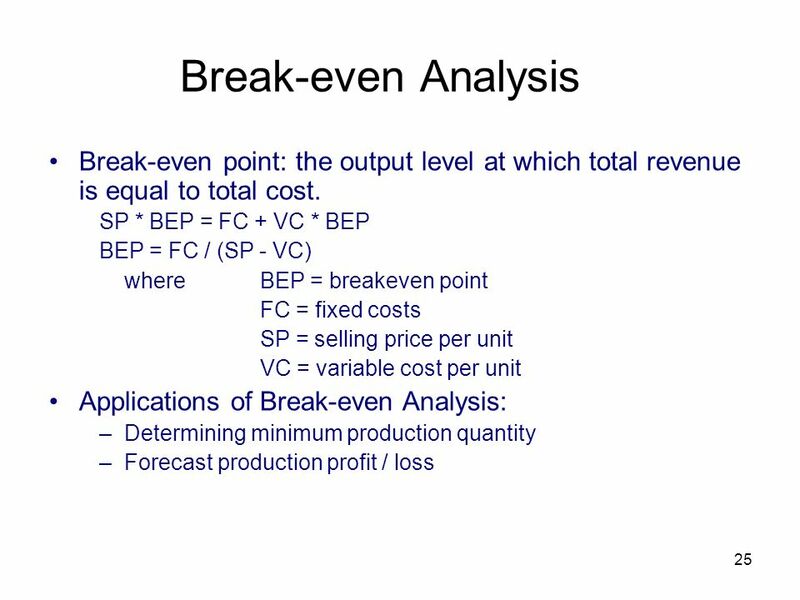 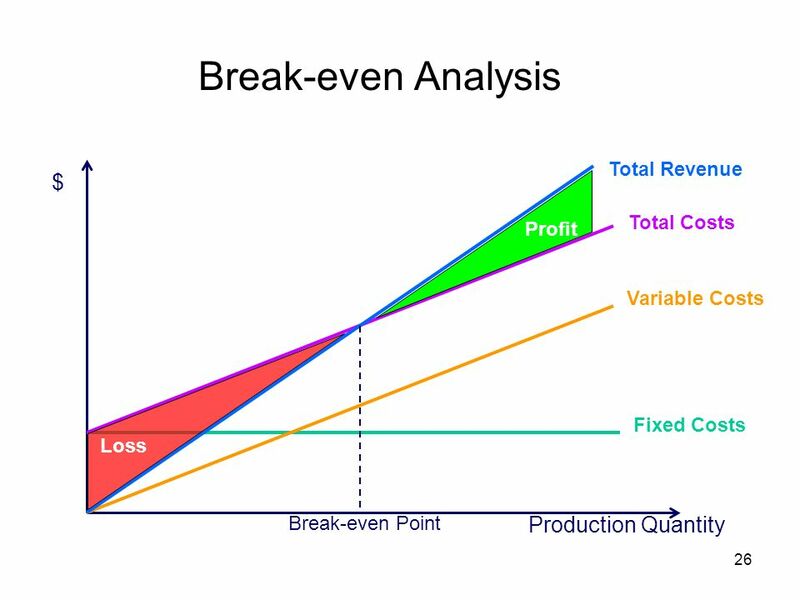 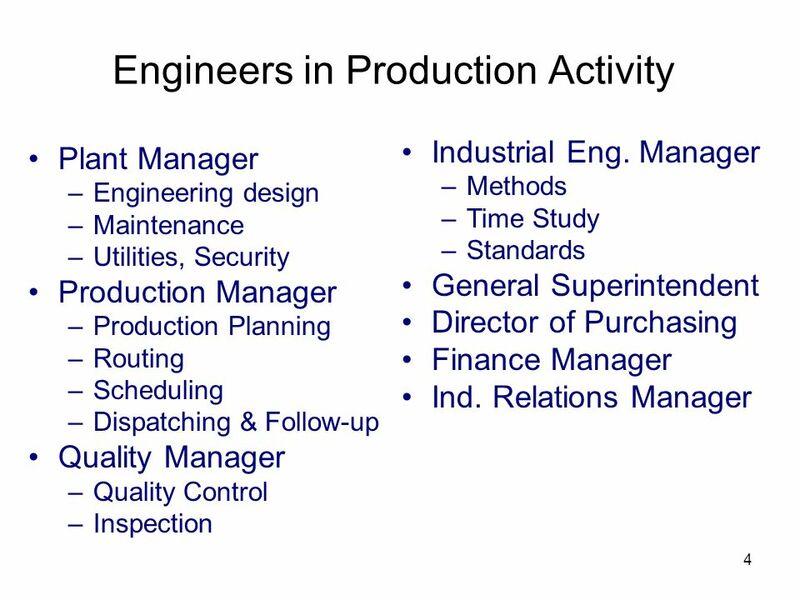 The supplier may be the upstream process within the plant or an outside supplier. 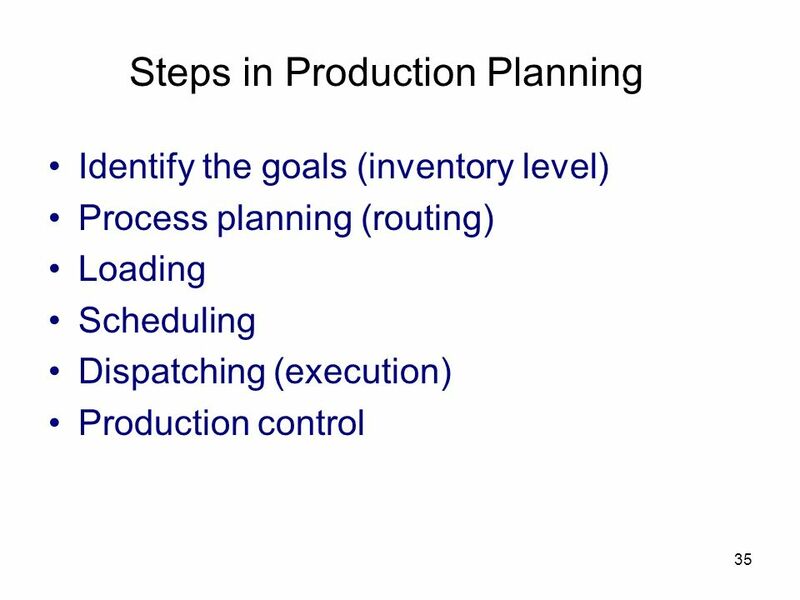 Master Production Schedule (MPS): mix of known demand, forecasts and product to be made for finished stock. 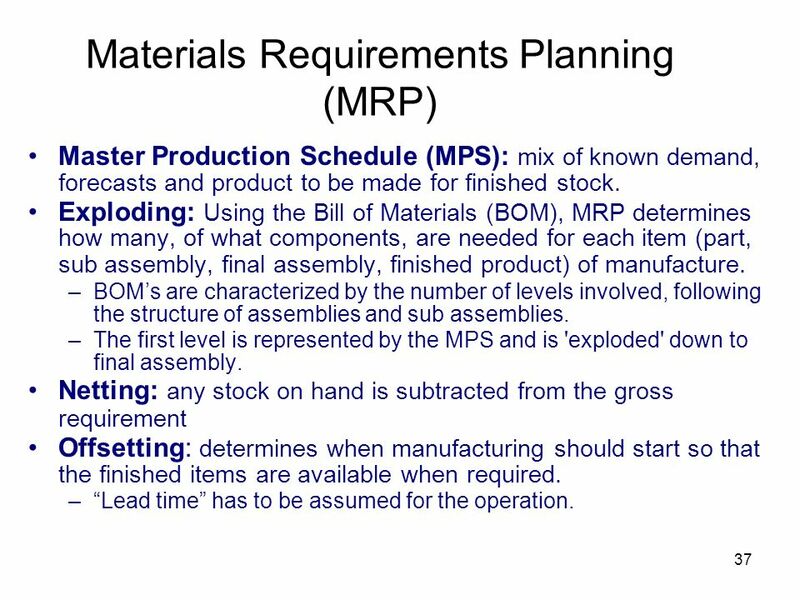 Exploding: Using the Bill of Materials (BOM), MRP determines how many, of what components, are needed for each item (part, sub assembly, final assembly, finished product) of manufacture. 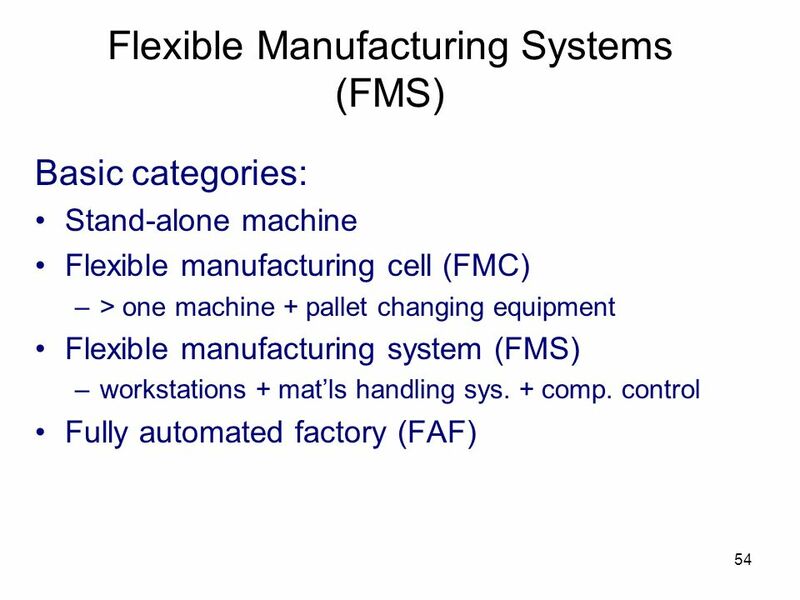 BOM’s are characterized by the number of levels involved, following the structure of assemblies and sub assemblies. 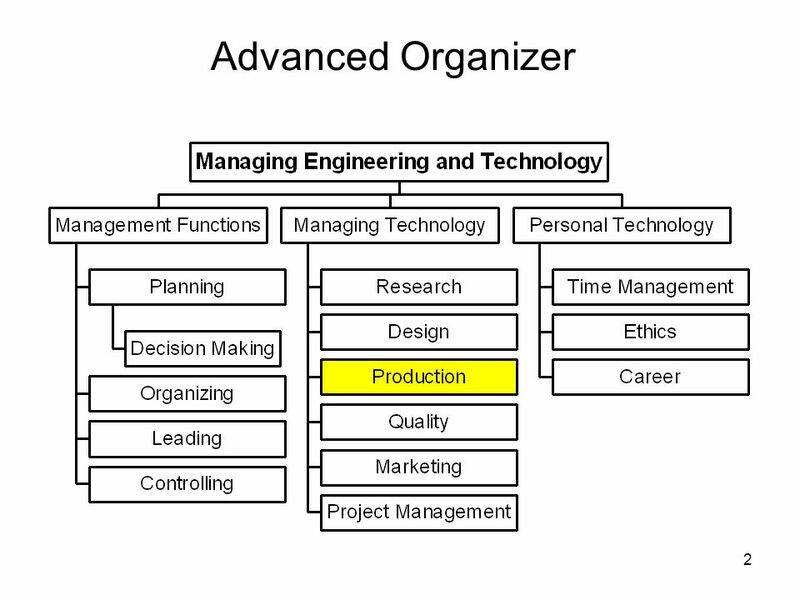 The first level is represented by the MPS and is 'exploded' down to final assembly. 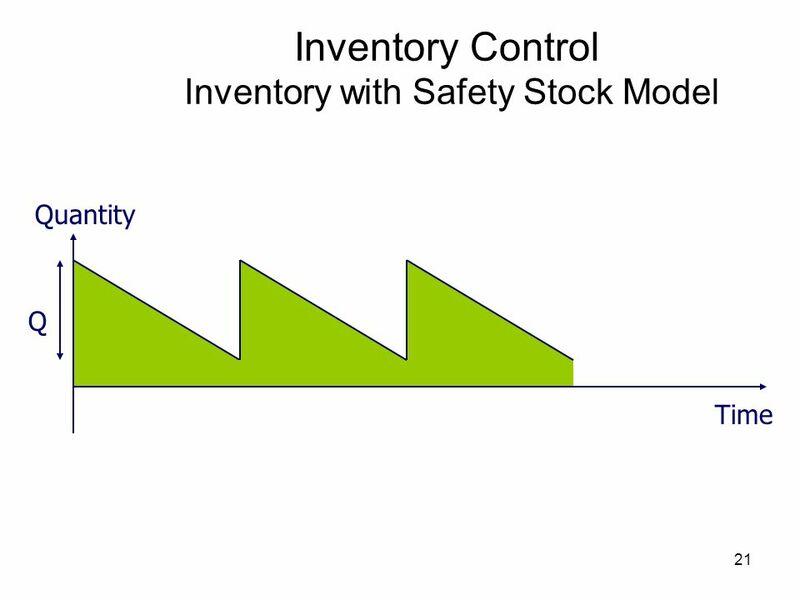 Netting: any stock on hand is subtracted from the gross requirement Offsetting: determines when manufacturing should start so that the finished items are available when required. 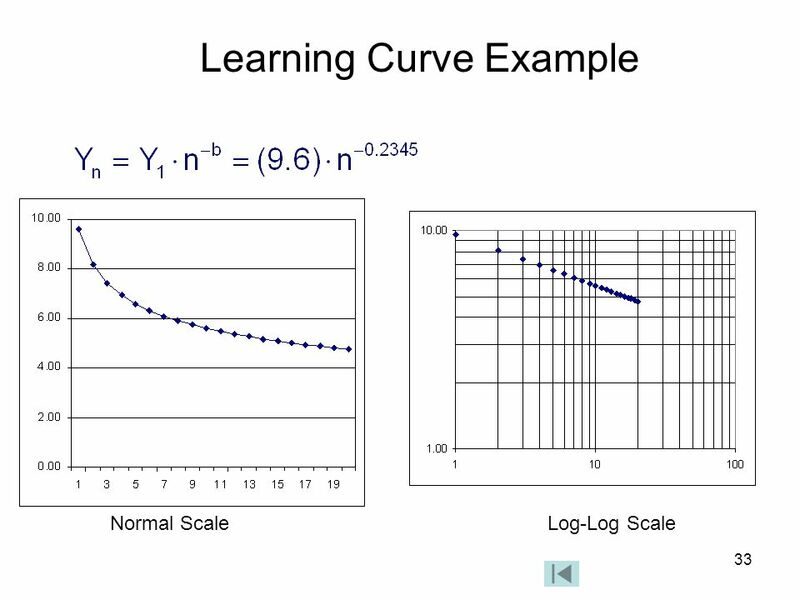 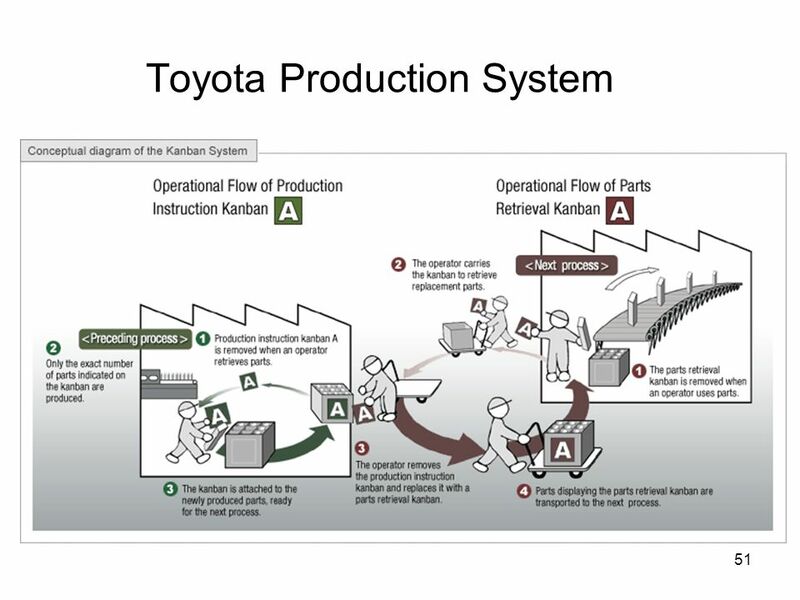 “Lead time” has to be assumed for the operation. 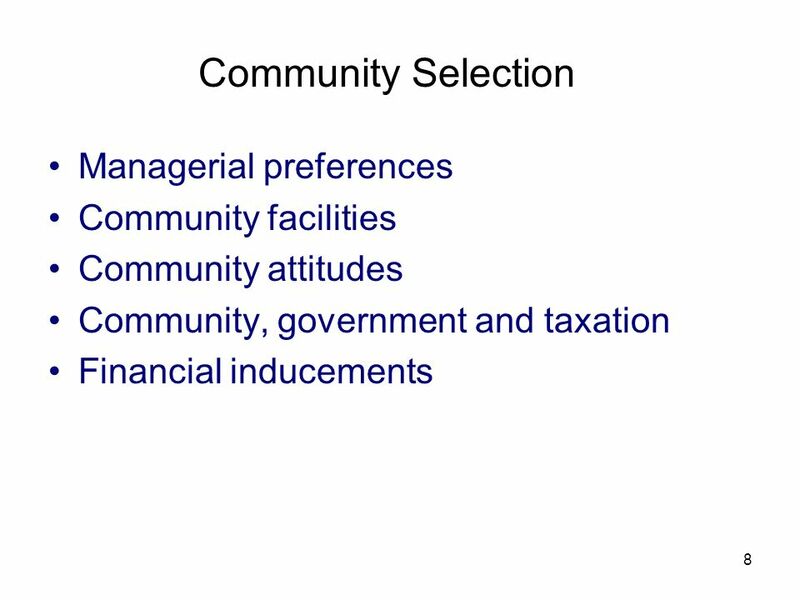 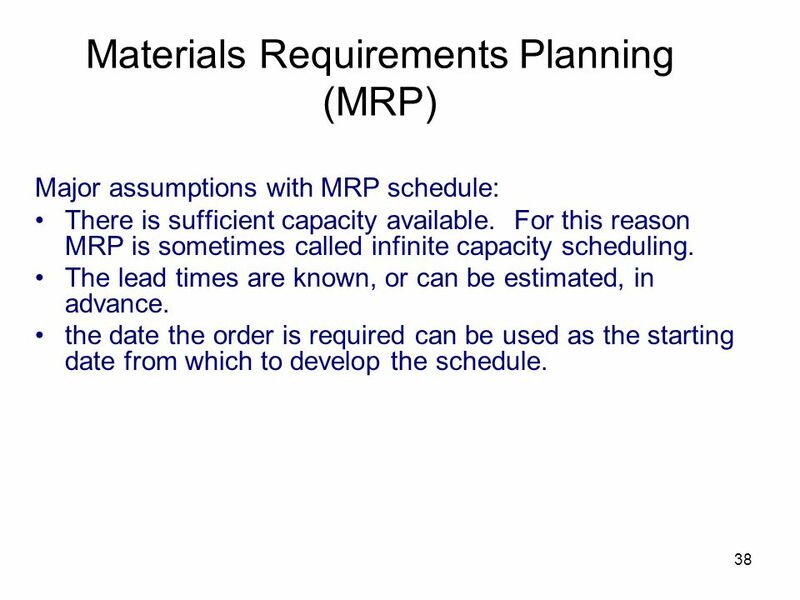 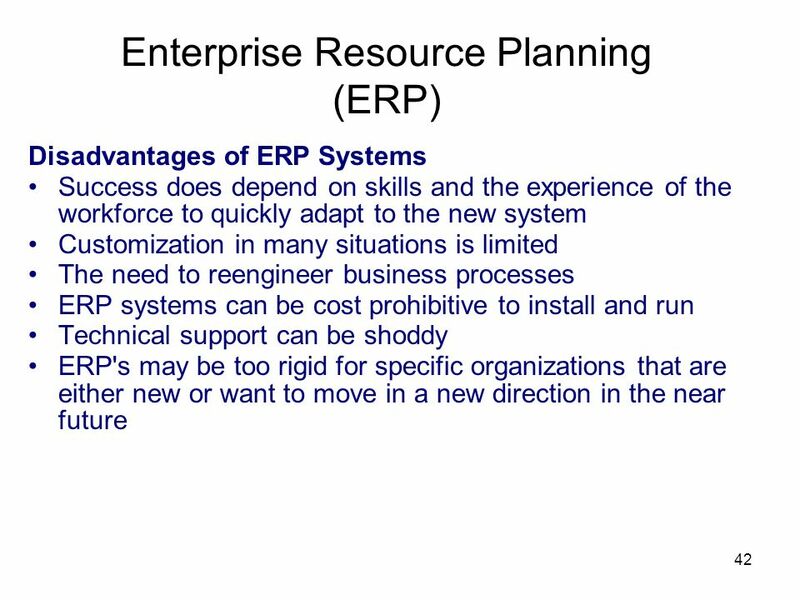 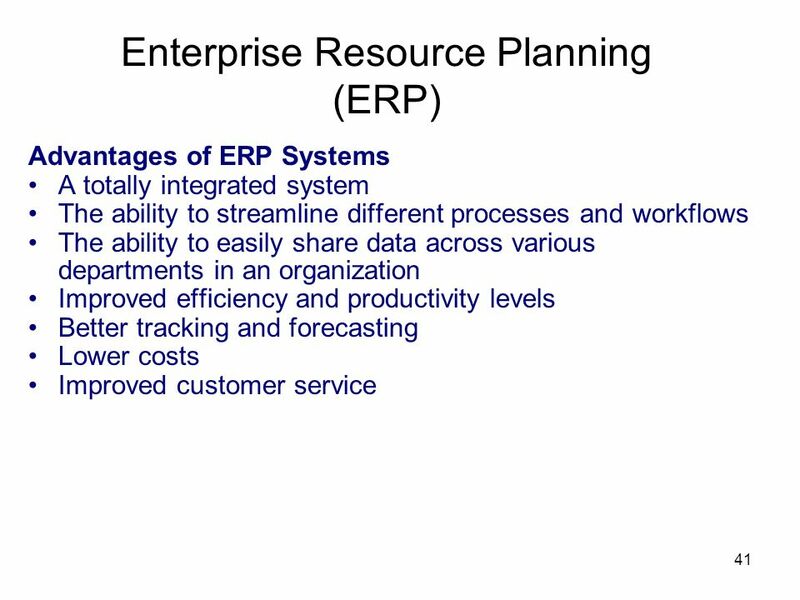 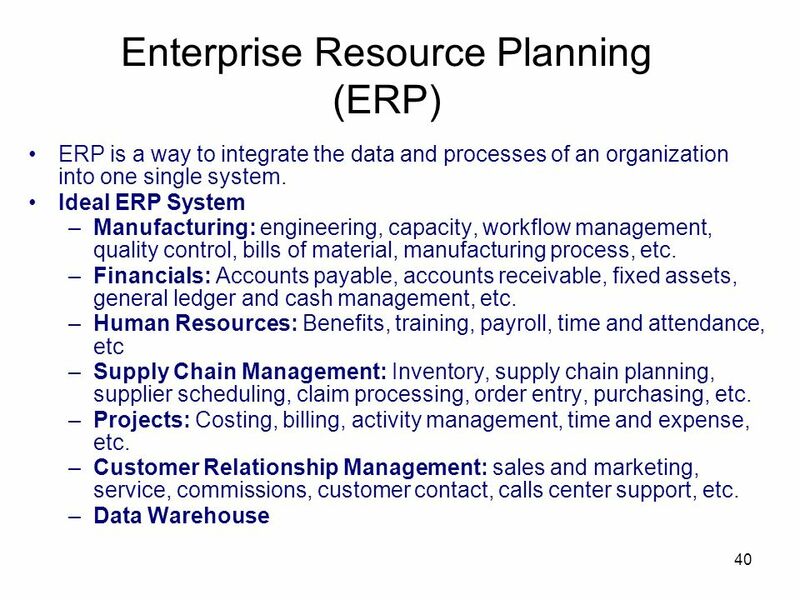 Major assumptions with MRP schedule: There is sufficient capacity available. 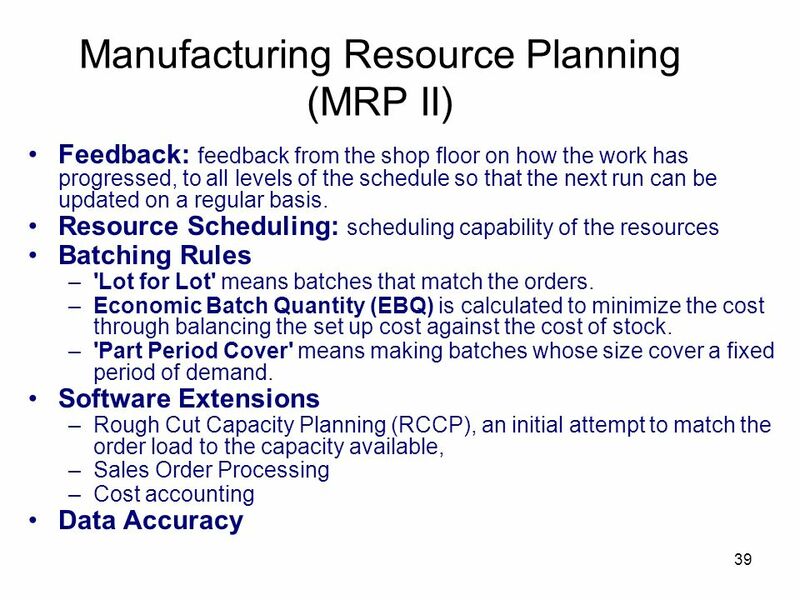 For this reason MRP is sometimes called infinite capacity scheduling. 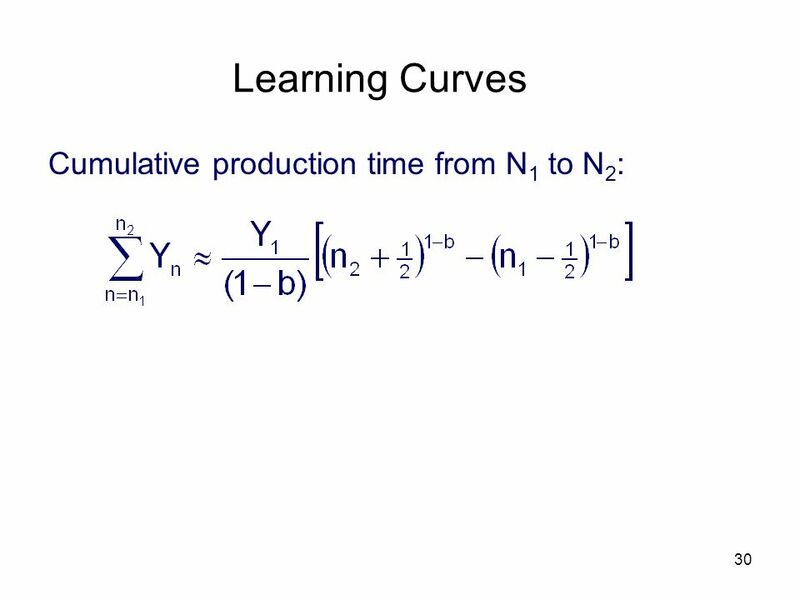 The lead times are known, or can be estimated, in advance. 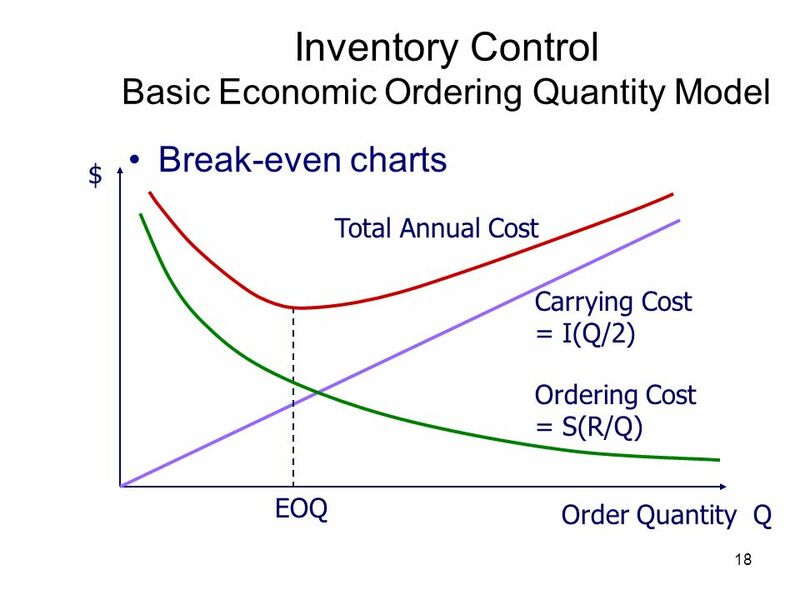 the date the order is required can be used as the starting date from which to develop the schedule. 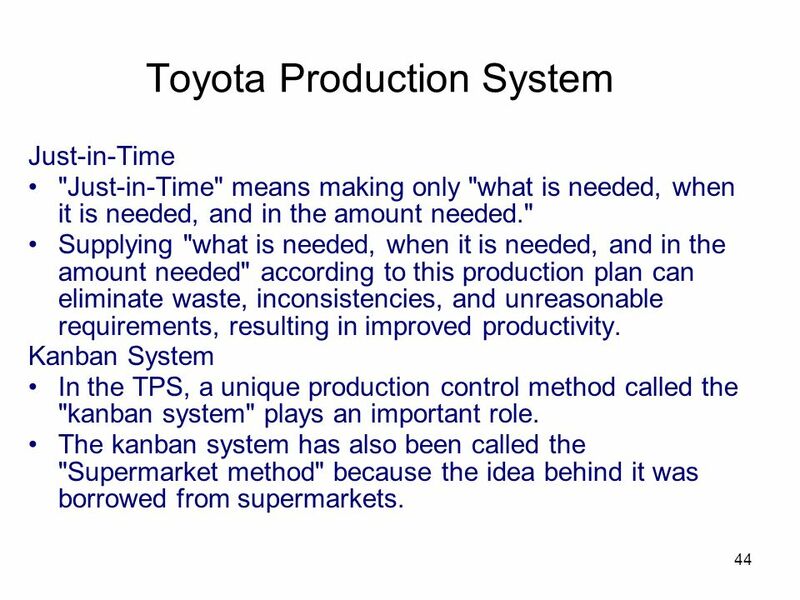 Just-in-Time "Just-in-Time" means making only "what is needed, when it is needed, and in the amount needed." 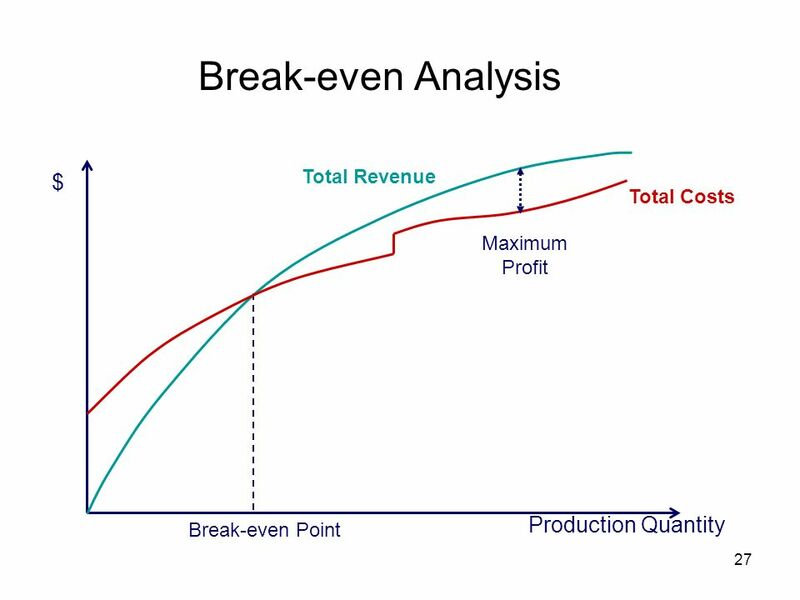 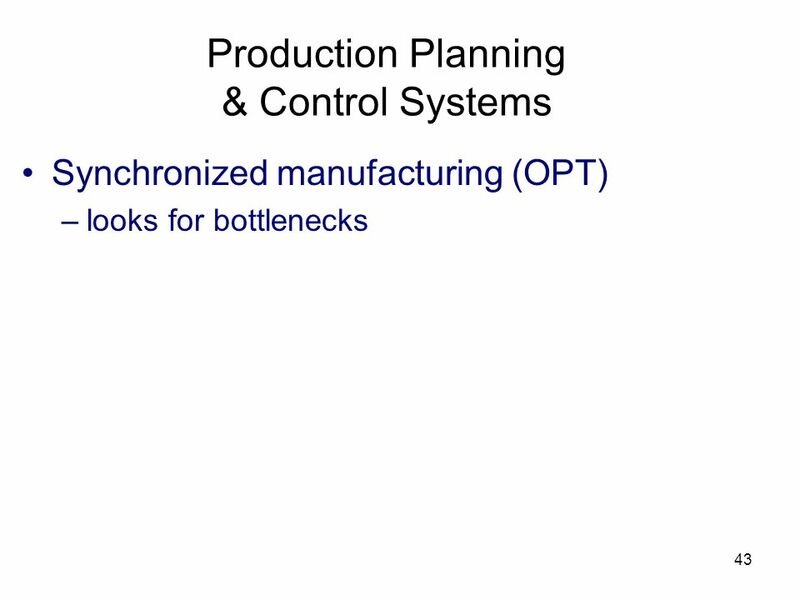 Supplying "what is needed, when it is needed, and in the amount needed" according to this production plan can eliminate waste, inconsistencies, and unreasonable requirements, resulting in improved productivity. 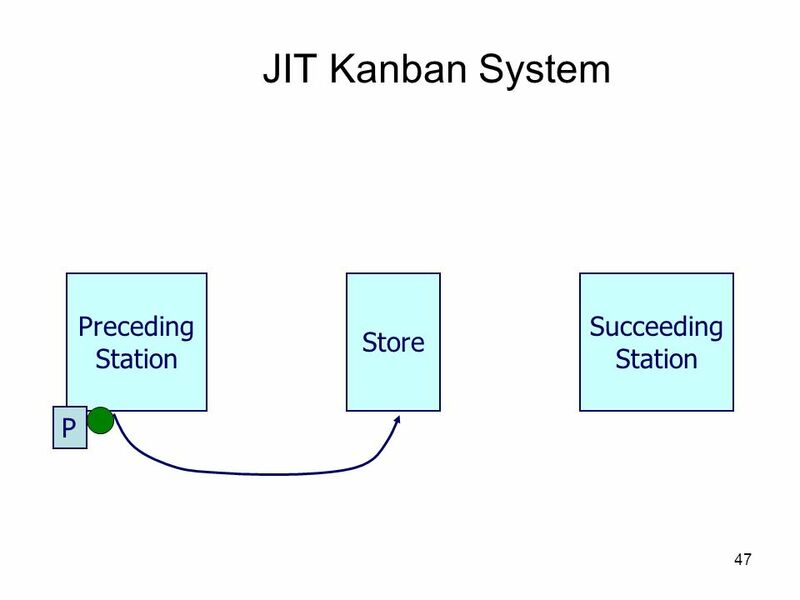 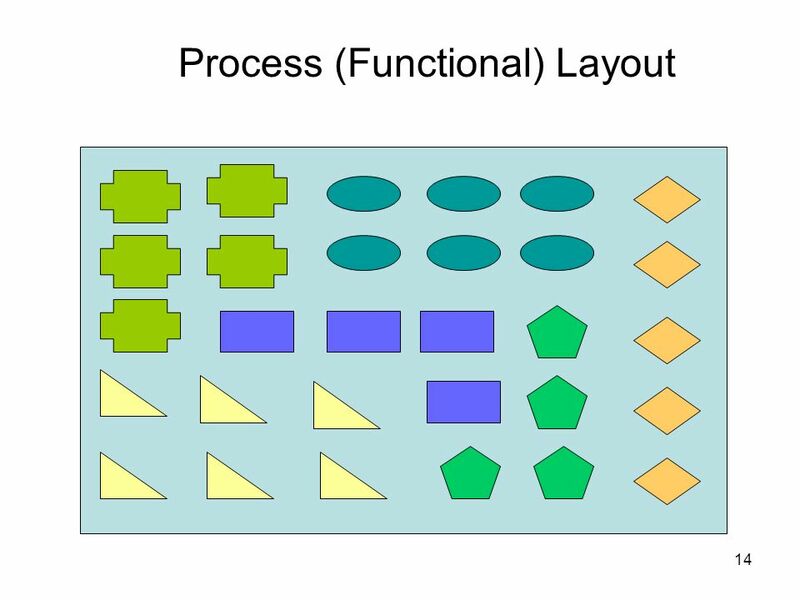 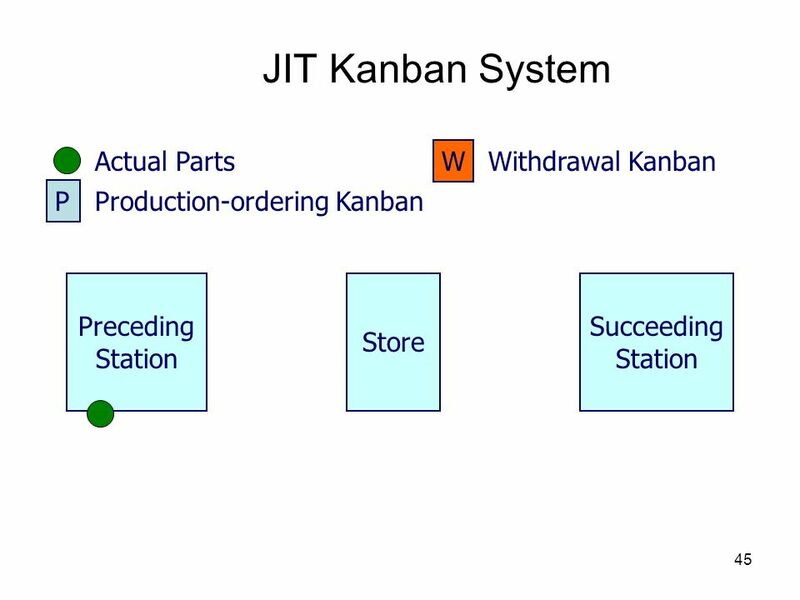 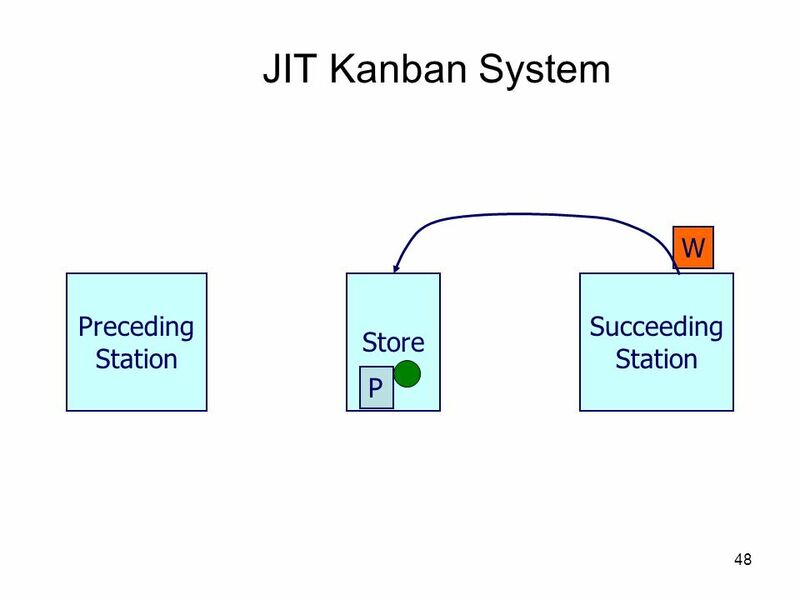 Kanban System In the TPS, a unique production control method called the "kanban system" plays an important role. 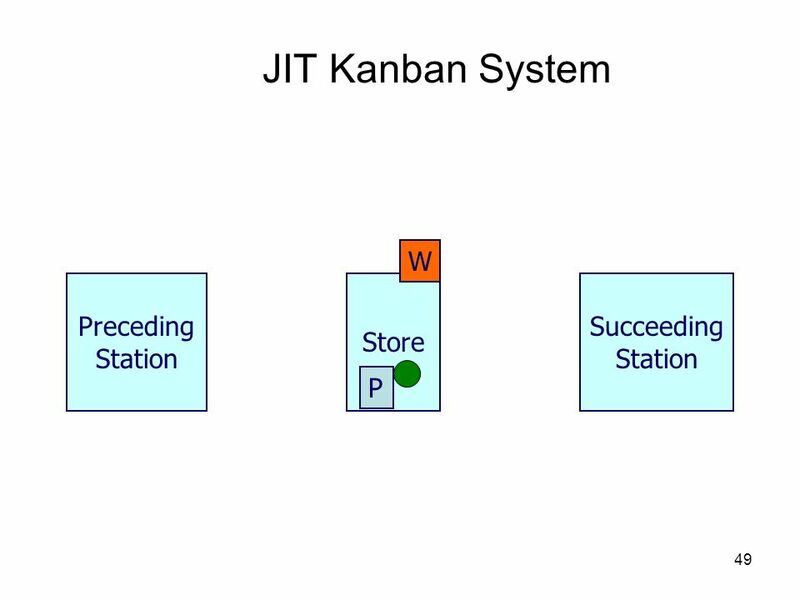 The kanban system has also been called the "Supermarket method" because the idea behind it was borrowed from supermarkets. 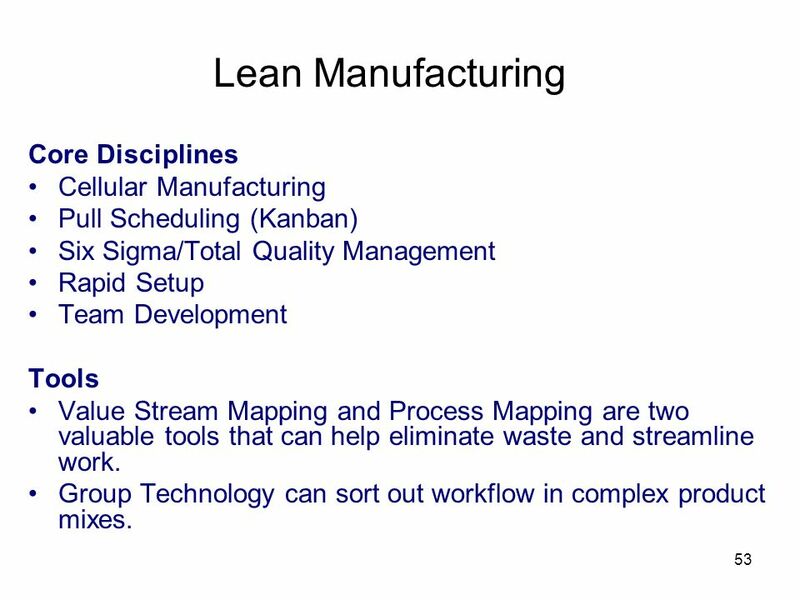 52 Lean Manufacturing Lean means "manufacturing without waste." 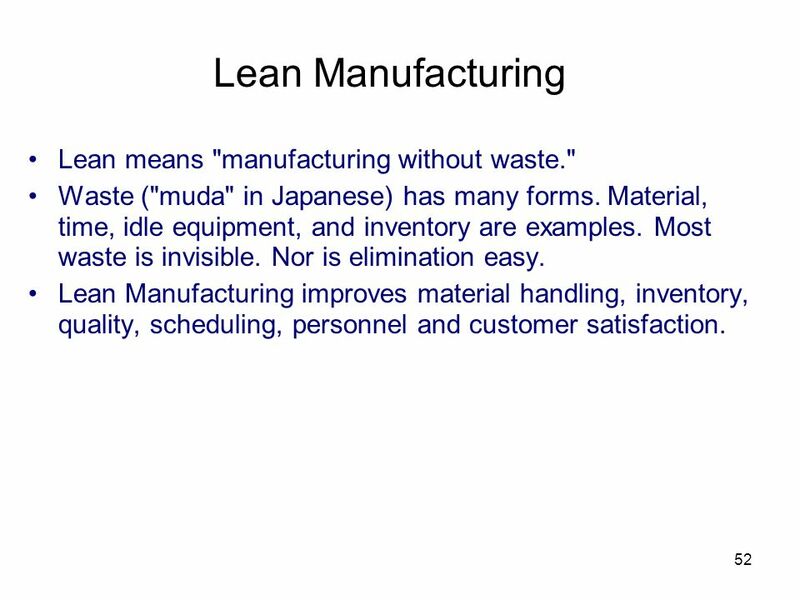 Waste ("muda" in Japanese) has many forms. 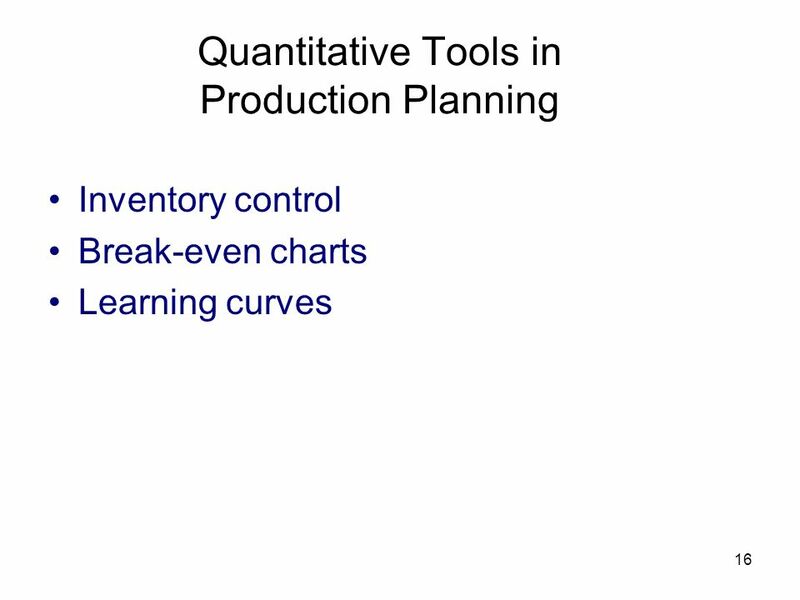 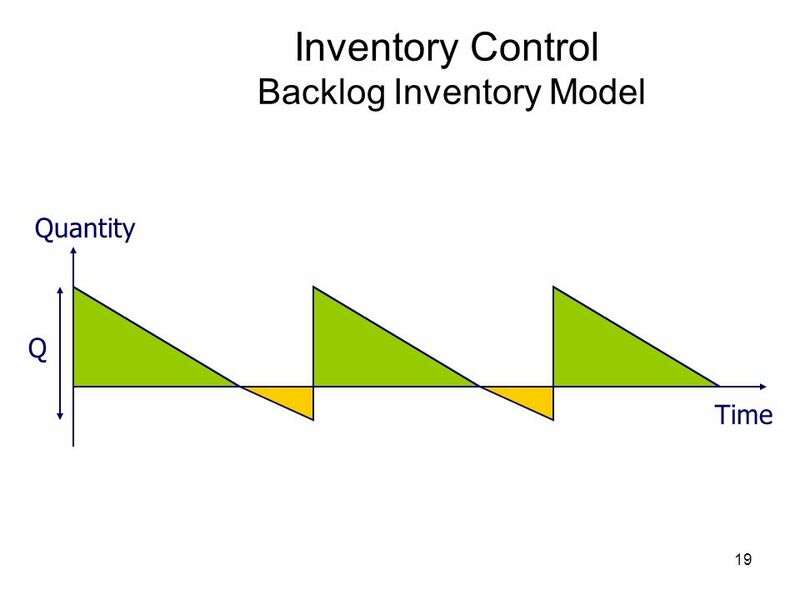 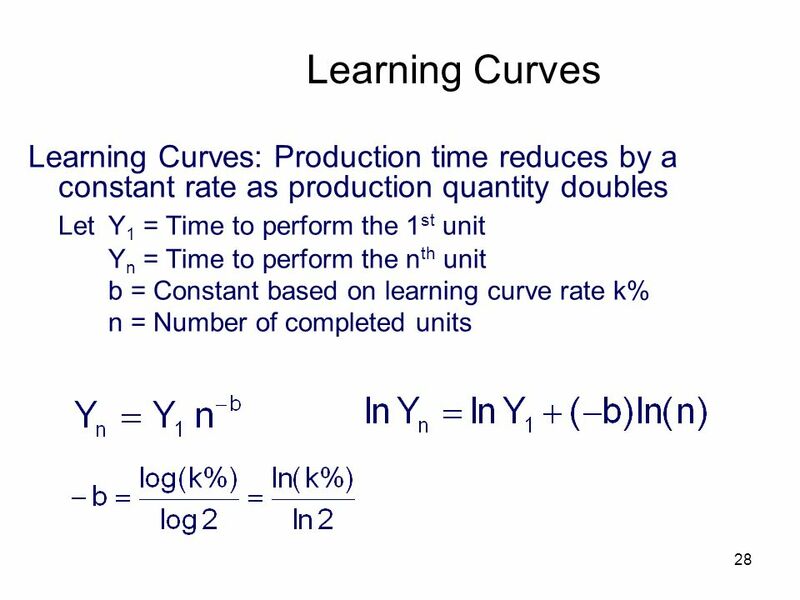 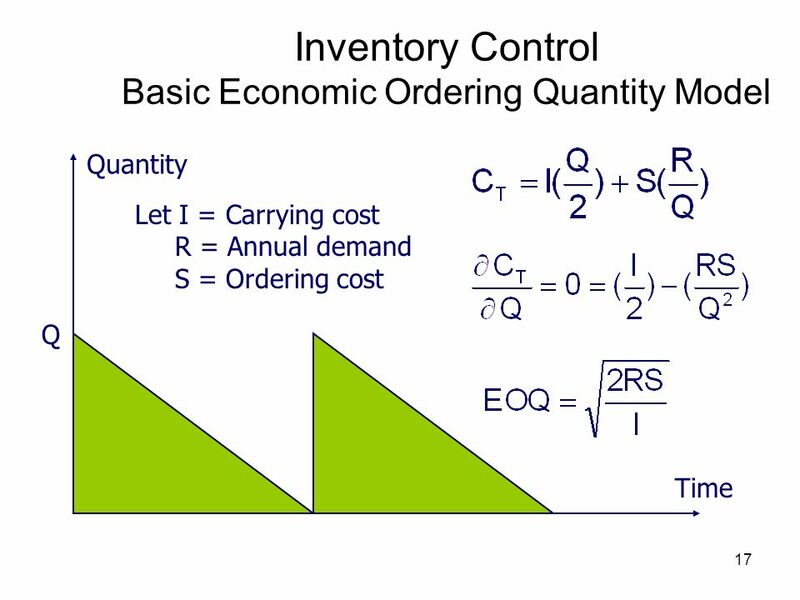 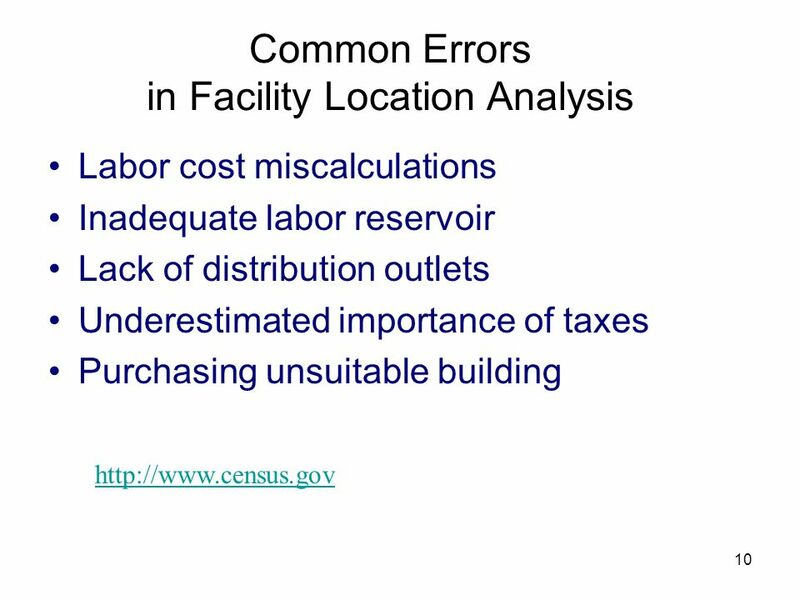 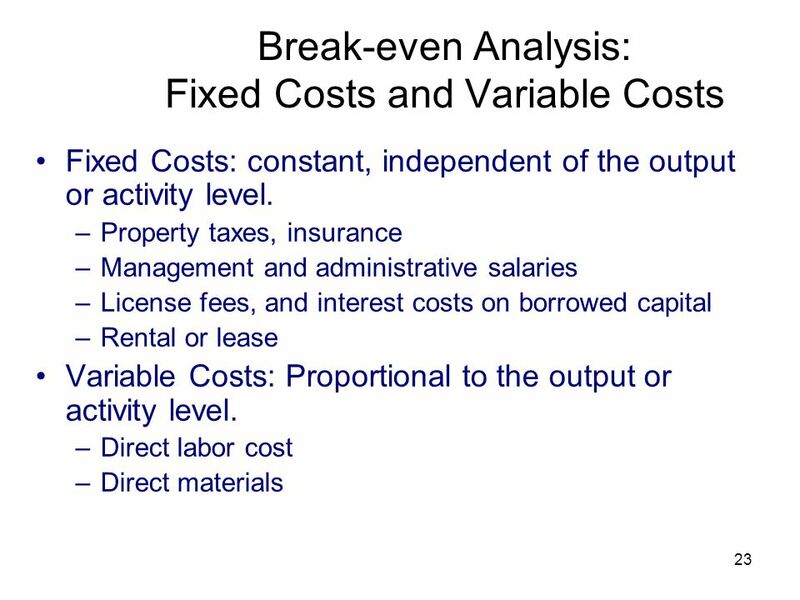 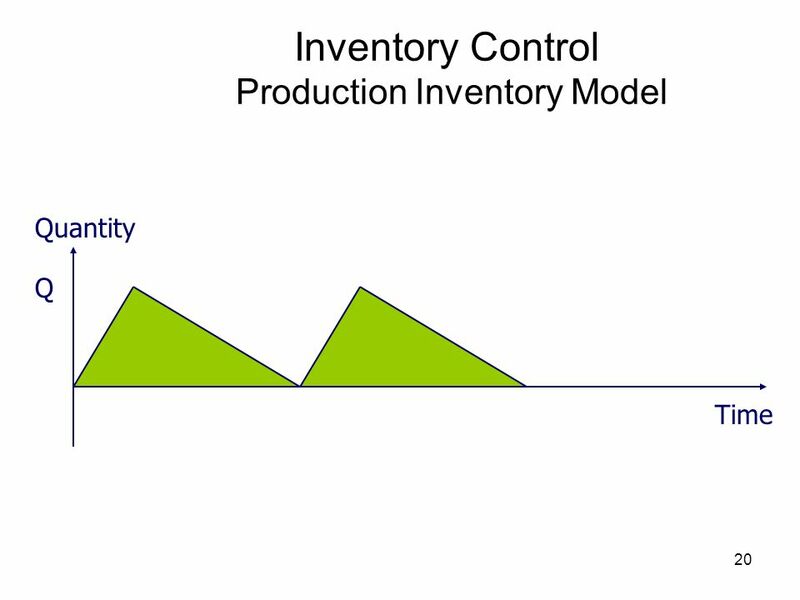 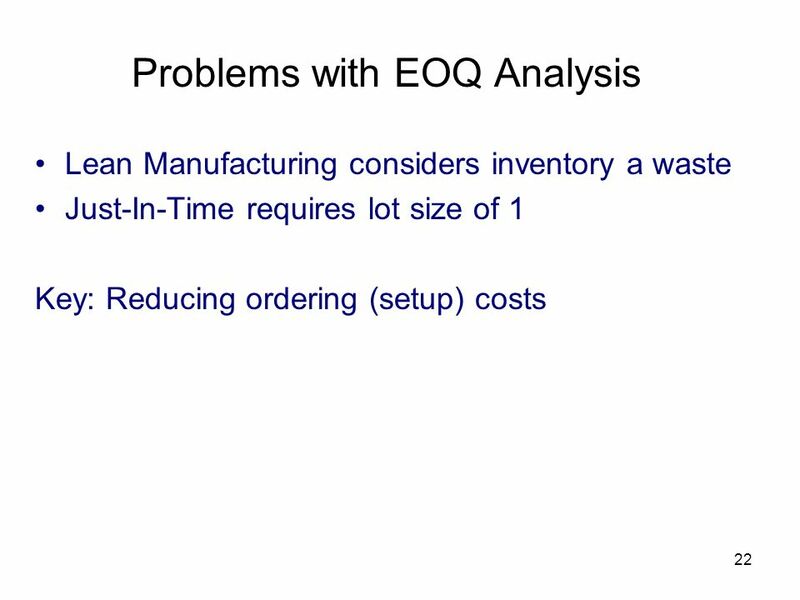 Material, time, idle equipment, and inventory are examples. 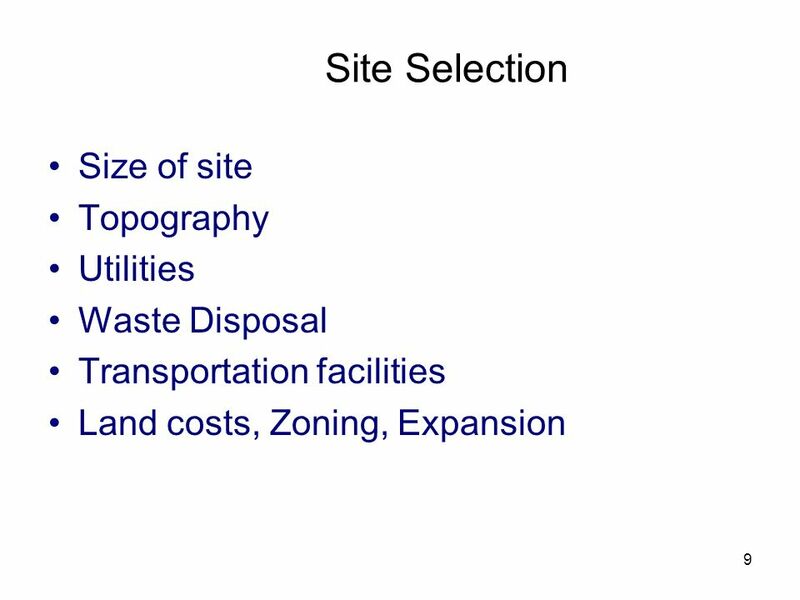 Most waste is invisible. 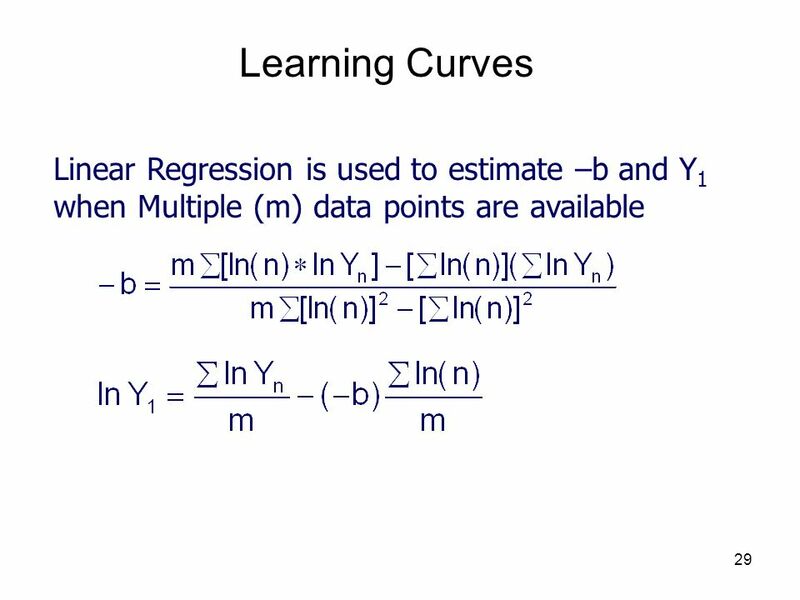 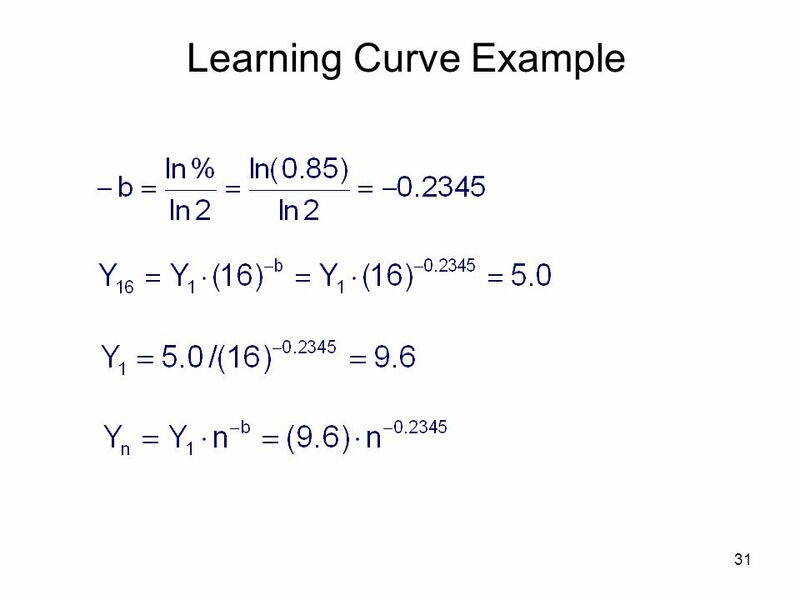 Nor is elimination easy. 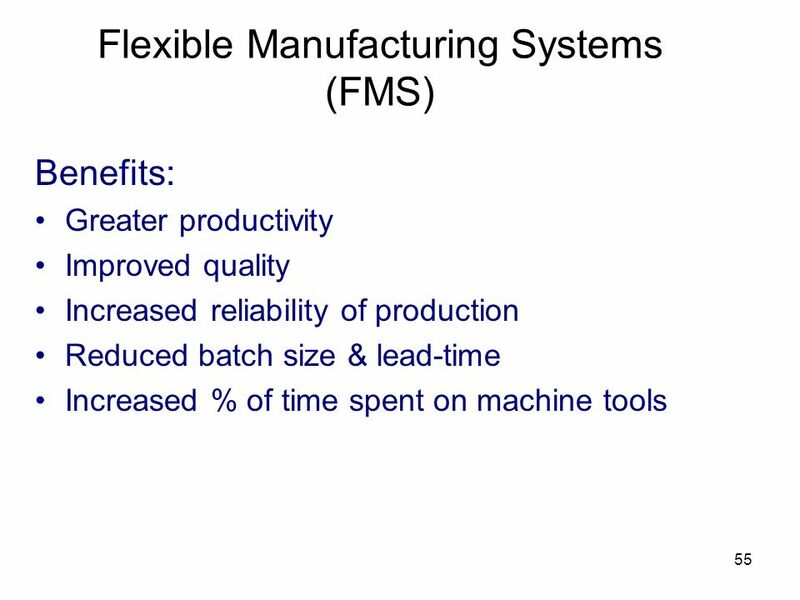 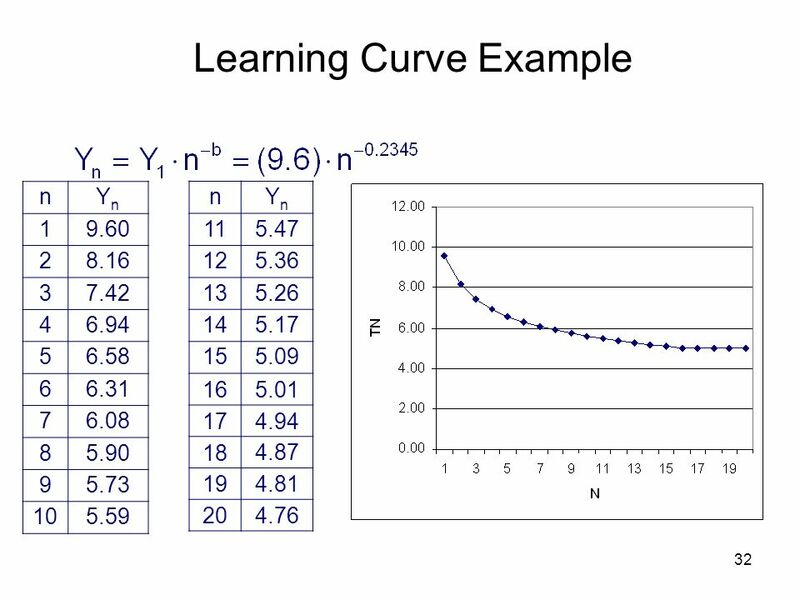 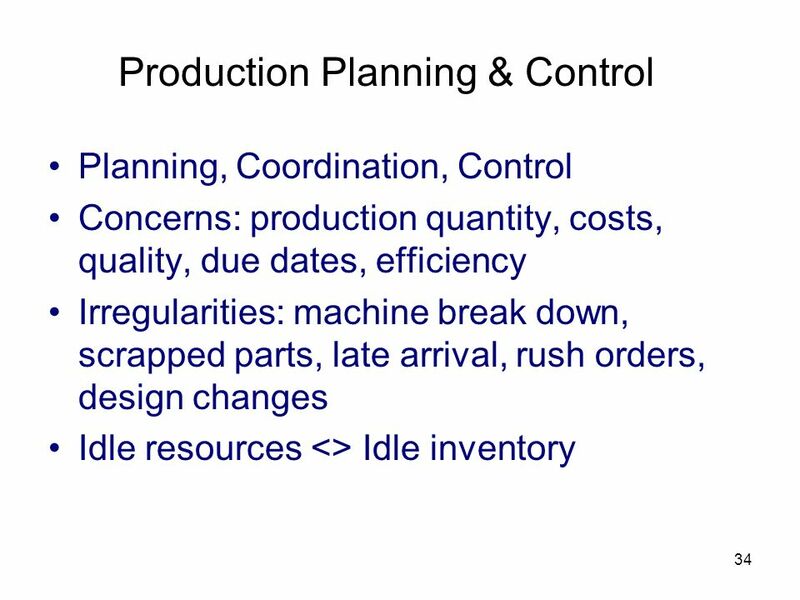 Lean Manufacturing improves material handling, inventory, quality, scheduling, personnel and customer satisfaction. 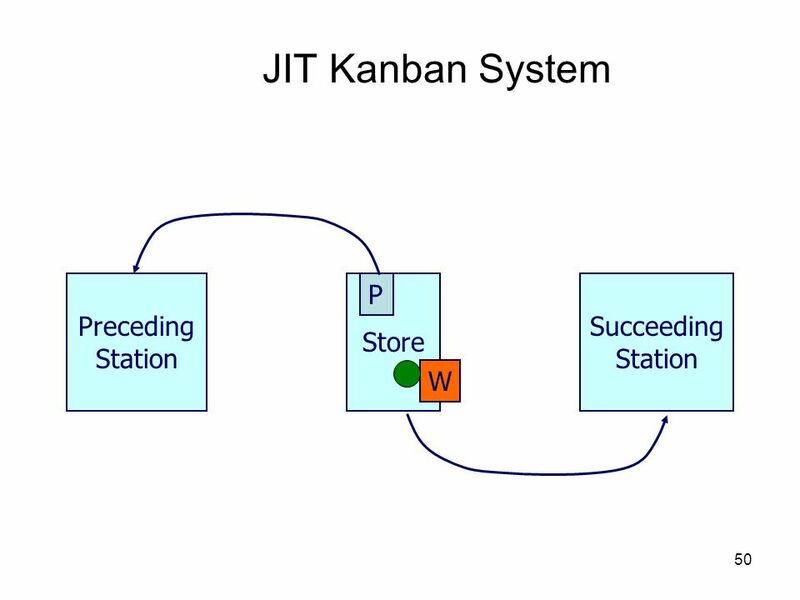 Pull Scheduling (Kanban) Six Sigma/Total Quality Management Rapid Setup Team Development Tools Value Stream Mapping and Process Mapping are two valuable tools that can help eliminate waste and streamline work. 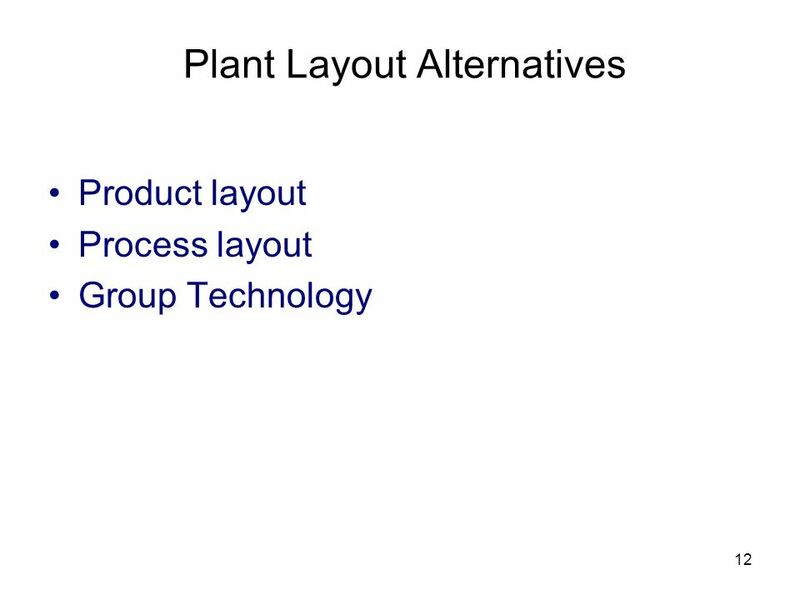 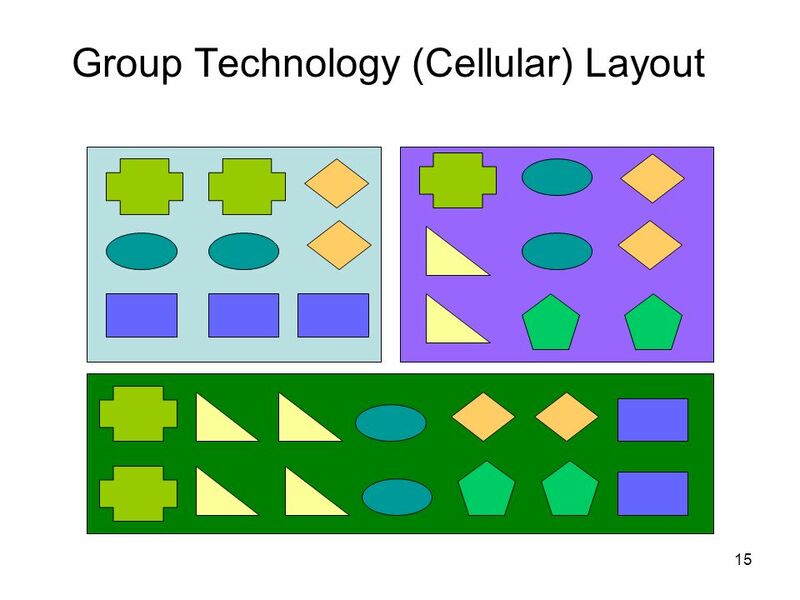 Group Technology can sort out workflow in complex product mixes. 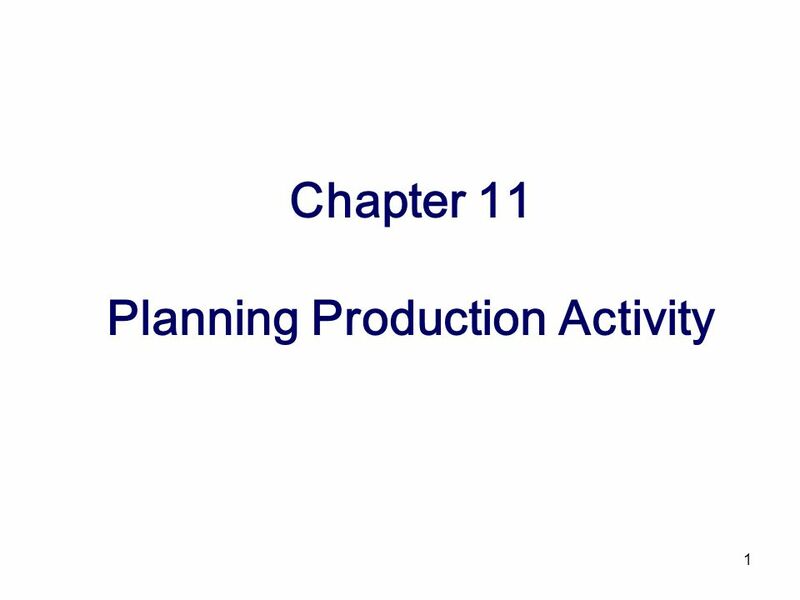 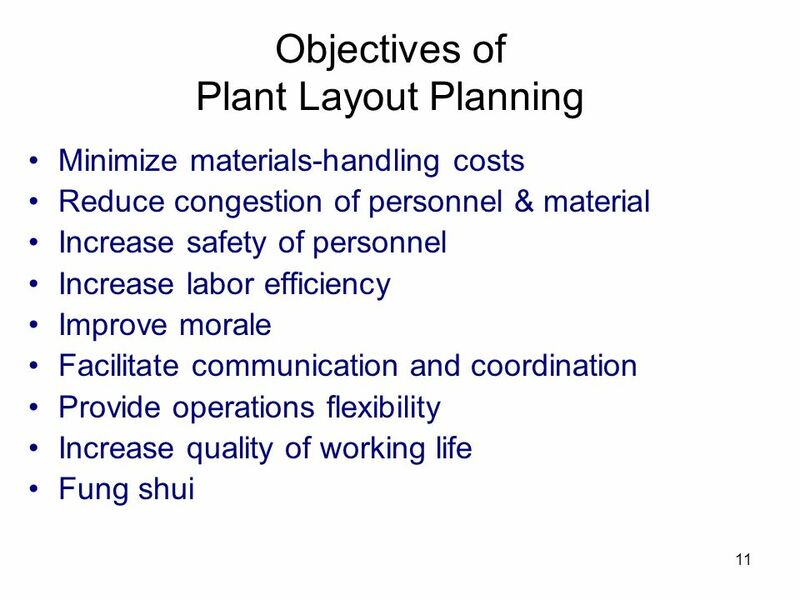 Download ppt "Chapter 11 Planning Production Activity"